Ilene Joyce Nielsen the daughter of Frederick and Willamina Barbara (Drucker) Wullenwaber was born November 1, 1925 at Tamora, Nebraska. 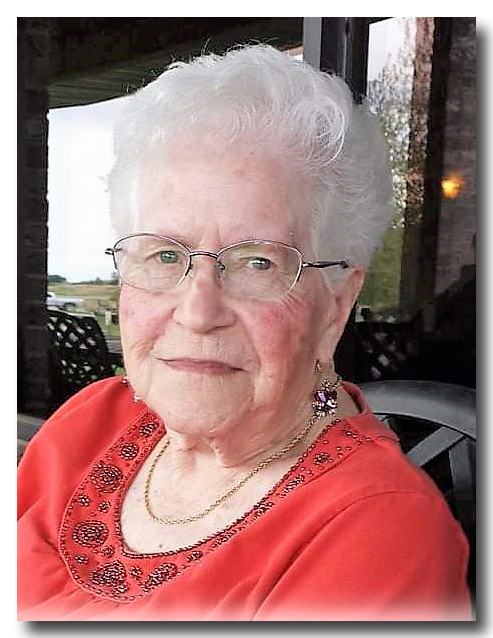 She departed this life on Monday, January 14, 2019 at the Good Samaritan Center in Superior, Nebraska at the age of 93 years. Ilene graduated from Nelson High School with the class of 1944. She was united in marriage to John Donald Smith and to this union two sons were born Frederick Harold and Jay Don. John passed away in 1957 and Ilene later married Gary Kay Nielsen on February 18, 1961; who adopted Fred and Jay. Ilene was a devoted Nebraska Cornhusker Football Fan and was an extremely loyal Chicago Cubs fan. Ilene loved going to coffee with her many friends and spent many hours watching sports on TV and of course one of her favorite TV shows, "The Golden Girls". She is preceded in death by her parents, husband John Smith, husband Gary Nielsen; son Jeffery Kay Nielsen; brother Al Wullenwaber and a sister Pearl Maxwell.. Survivors include her sons: Frederick Nielsen of Burlington, IA; Jay Nielsen of Superior, NE; grandchildren: Heather Haley and husband Steve; Kelly Cochran and fiance Nathan; Stephanie Betten and husband Jason; Melissa Nielsen and wife Amanda; Samantha Nielsen; Jacquelyn Nielsen; great grand children: Logan Cochran; Alexis Murillo; Jacob Cochran; Tyler Haley; Franklin Krieger; Ethan Krieger; Dylan Saltzman; Kaitlyn Nielsen; Liam Nielsen; great great grandchildren: Cambria; Elena; Manny and Conner;other relatives and a host of friends. Funeral services were Thursday 2:00 pm, January 17, 2019 at Salem Lutheran Church with Pastor Ethan Feistner officiating. Burial was at the Salem Lutheran Church Cemetery. Music for the funeral service was provided by Sonia Schmidt; organist and Stephanie Thayer; vocalist who sang two solos: "The Old Rugged Cross" and "How Great Thou Art". Serving as casket bearers were: Jim Curfman, Nathan Varnadore, Steve Haley, Tyler Haley, Cory G. Kopsa and Dave Johnson.